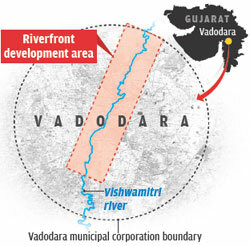 During monsoons, residents of the industrial city of Vadodara face a strange problem. As the rains swell the Vishwamitri river, which passes through the heart of the city, crocodiles pop up at the most unlikely places—roads, rail tracks and parks. Travelling through the sewer line, baby crocodiles have sometimes even appeared in bathrooms. Vadodara is an island of crocodiles, says B C Choudhury, conservationist and former scientist at the Wildlife Institute of India, Dehradun. The statement is not without basis. The Gujarat district, with a population of over 3.6 million, is home to hundreds of mugger crocodiles (Crocodyluspalustris), a species found throughout the subcontinent. And their numbers are rising. With the spike in crocodile numbers, cases of attacks on humans have also increased in the past two decades. “I have been collecting data on crocodile attacks in Gujarat since 1960. Till 2013, some 60 attacks were reported in the state—an average of one attack a year. But in 2014, the number of attack was 24. Of these, 12 were in the Vishwamitri basin,” says Raju Vyas, crocodile expert and an official with the city administration. The reptiles inhabit the Vishwamitr iriver, its tributaries—the Dhadhar, Surya and Dev—and numerous ponds in the district. They are also found in the Narmada, which forms the district’s southern border. People who live in close proximity of the water bodies and use them for fishing and washing, or defecate near them, are particularly vulnerable to crocodile attacks. “The attacks take place because of mistaken identity. A human being washing clothes on the river bank may appear something similar to a four-legged prey animal to a crocodile,” says Choudhury. “In the last census in 2010, there were 206 crocodiles in Vadodara city, but in a district-wide survey done on January 20-21 this year, we counted 450 crocodiles. The city alone accounted for 250,” says V K Saxena, deputy conservator of forests (in-charge), Vadodara Range. “The census is usually conducted in winters because cold blooded crocodiles bask on the banks of water-bodies during the day, making it easy to count them. Counting is also done in the night because their eyes glow in the dark, making it easy to identify them,” says Saxena. So, what is the reason behind the increase in numbers? “Being listed under Schedule–I of the Wildlife Protection Act, 1972, crocodiles have legal protection. Moreover, unlike in other parts of the country, they are not killed in Gujarat because the mugger crocodile is the mount of Khodiyar Maa, a form of the Mother Goddess worshipped widely in state. “But the single biggest reason is the animal itself. It is a very tough species, found from southern Iran to Bangladesh. It has evolved to survive in a drought-prone region and is very adaptable,” Vyas adds. 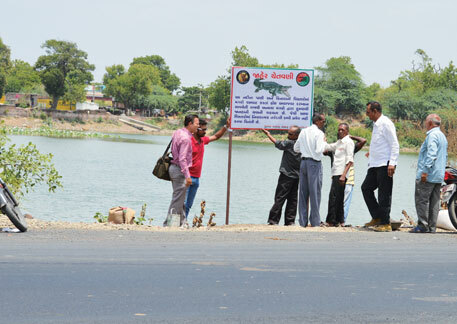 City planners have mooted a proposal to declare a certain stretch of the Vishwamitri passing through the city a protected zone for crocodiles and beautify it. This, they say, will prevent the attacks. “It will not be a protected zone as defined under the Wildlife Protection Act. But we will ensure that the animals are not disturbed,” says Vyas. The initiative has been proposed under the Vishwamitri River front Development Project. The project has been conceptualised on the lines of the Sabarmati Riverfront project in Ahmedabad that came about when Prime Minister NarendraModi was the chief minister of Gujarat. A feasibility study has been done and the report has been sent to the state government for approval. “We are still scouting for a stretch alongside the Vishwamitri between Vadodara and Jambughoda (in neighbouring Panchmahal district) to set up the protected zone. It is going to be a long process. First, the approval of the state government and then of the Centre will have to be sought. But in the next two-three years, we hope to have such a zone for the Vishwamitri crocodiles,” says Saxena. “This is a very enlightened move,” says Romulus Whitaker, founder and trustee of the Madras Crocodile Bank, the biggest crocodile sanctuary in India. Though encouraging big reptilian predators near an area may seem a bit strange, there are plenty of examples, both in India as well as other parts of the world where crocodiles or other mammalian predators live side by side with humans with little or no conflict, he adds. However, Whitaker has a word of caution. “What is important is how the forest department and municipal officials implement the idea, keeping in mind the need to teach people to live safely with predators. And of course, determining the crocodile carrying capacity of the ‘protected zone’ is crucial,” he says. Choudhury echoes Whitaker’s views. “Maintaining the crocodile population is not difficult. The administration should look at it as an opportunity rather than as a constraint. They should work out the carrying capacity of the proposed crocodile park. They can always remove crocodile eggs before they hatch to control the population. Most importantly, they should provide suitable conditions: water all year round so as to maintain a metre-and-a-half depth (optimum level for crocodiles) in a kilometre-long stretch of the river,” he says. Will the project succeed? “Knowing the Gujarati crowd, they would never kill an animal, however dangerous it might be. I am sure there is an opportunity here,” says Choudhury.